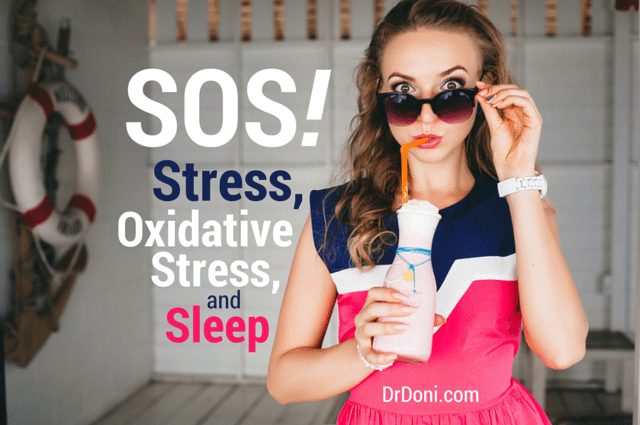 Dr Doni explains the relationship between stress, oxidative stress, and sleep, and offers three tips for staying on top of all three. “Stress is essential to life.” That is what I wrote in my first book, The Stress Remedy. So, as much as it is about how we can “remedy” the effects of stress, it is also about finding a careful balance in our relationship with stress. I believe this balanced relationship starts by starting to accept that stress is not something to eliminate completely, nor is it something we can ignore. It exists in our environment. It is all around us in physical and non-physical forms and we have to learn to live with it—and manage it—so that it doesn’t build up to such high levels that we can no longer cope with it and it starts to make us ill.
Trauma, toxins, deadlines, sleep deprivation, and sugar all cause our bodies stress. Stress also exists internally as inflammation, oxidative stress, dysbiosis (imbalanced bacteria in your gut), and leaky gut. We can’t live without it and, at the same time, it is the stress we are exposed to, the way we react to it, and the support we give our bodies to adapt and recover from it that determines our health. This is what you may have heard of as “adrenal fatigue” or “burnout,” both ways of saying that your body is no longer keeping up with the amount of stress it is experiencing. There are several possible outcomes of having more stress than your body can handle, not just fatigue. Your body can get “stuck” in stress mode even when the stress is gone. Or it can become depleted and no longer able to mount a stress response when you need it or even produce a normal amount of cortisol and adrenaline to get you through the day. Remember that your body is resilient and can recover from this type of adrenal distress or stress dysfunction with the right support. I have some tips to start you on the right track below. How Does Oxidative Stress Fit In? Oxidative stress is the type of stress that exists inside our cells and deep inside our bodies where we cannot see it. It’s what damages our cells and the mitochondria that produce the energy they need, leading to loss of function and aging. And wouldn’t you know, stresses in our external environment such as pesticides, heavy metals, processed foods (which are a major source of sugar), and chemicals in the air and food (BPA, phthalates, benzenes, formaldehyde, etc) all increase oxidative stress, as does a disruption in sleep (more about sleep in a minute)1,2. Not only that but, when your liver has more toxins to process than it can handle, oxidative stress increases. When you’ve had to take antibiotics (or proton pump inhibitors) numerous times, killing your good bacteria and causing leaky gut, oxidative stress increases. When your blood sugar levels go high and your weight starts to increase, so does your oxidative stress. When your mitochondria are not able to keep up with the normal numbers of free radicals that come along with energy production, oxidative stress increases. And, when oxidative stress increases, it takes a toll on our nerves, blood vessels, eyes, skin, and more. This is one of the hottest areas in research today, with hundreds of studies on oxidative stress being published each month. How Is All This Related To Sleep? Sleep is your stress and oxidative stress recovery process. Without it, stress and oxidative stress add up, damaging your mitochondria, nerves (click here for articles that explain how this can lead to Alzheimer’s disease), and blood vessels (it seems we should be more concerned about the effects of oxidative stress on our blood vessels than we are about cholesterol) 3,4,5. While some people feel they can get away with less sleep, they are actually leaving themselves vulnerable to the effects of stress. This is because a lack of sleep increases oxidative stress. In addition to this, it is during deep, delta sleep that our body’s cell cleaning mechanisms (autophagy) turn on and the hormones that repair cells get to work (growth hormone, for example). If they don’t have enough time to finish these jobs while you sleep, more cells are damaged, cancer cells escape our monitoring systems, and you experience not only fatigue (which we all expect with too little sleep) but also memory loss, weight gain, and increased pain. So, as you can see, Stress, Oxidative stress, and a lack of Sleep – or SOS – are distress signals that tell us it’s time to take care of your body. Now that you understand all this, I want to give you a few tips to help you address that distress and support your body in keeping up with all that it is exposed to on a daily basis. I’ve also added a section to my blog posts that offers guidance for practitioners—find it below. And if it contains sugar, you don’t want it either. Americans consume, on average, over 150 pounds of sugar each year, mainly from packaged products where “sugar” is listed as an ingredient. Keep a close eye on what is in the food you buy and avoid chemicals and sugar if at all possible. When it comes to fruit and vegetables, color equals anti-oxidants, and you want as many of them as you can get to counterbalance oxidative stress. I’m talking green (spinach, celery, broccoli, olives), red (berries, beets, peppers, tomatoes), purple (potatoes, grapes, cabbage) and orange (citrus fruit, figs, sweet potatoes, and peaches). Challenge yourself to have at least 3 colors each time you eat. I mean sleep! It can seem like an activity that you could put off or cut down on, but it is arguably the one thing NOT to compromise on because your body is actually quite busy while you sleep cleaning out the effects of the day’s stress, including oxidative stress, so you are ready to meet the stresses of the next day. If you want to find out more about sleep, how to get more of it and ensure that it’s of the best quality, then look out for my newest book, INSOMNIA: A Natural Guide to Better Sleep. If you’d like more help right away with what to eat, how to get better sleep (and more of it) you may want to check out my Stress Remedy Programs. They support you to accomplish these tips and more in 7 or 21 days (your choice). I love to read about your experiences. Please comment below, perhaps by sharing how you accomplished eating 3 colors or what you recently discovered on a product label that surprised you. We’ll learn together. Finally, I’m very excited to tell you about a new test that can be used to measure oxidative stress in the mitochondria. Next time, I’ll be explaining in more detail what the mitchondria do, how it’s possible to have too little oxidative stress and why this new test is so exciting (and important). To ensure you receive my future articles, please sign up to receive my weekly e-newsletter here. When you meet with a patient who has multiple health concerns, including disrupted sleep, and you are wondering where to begin, I suggest starting by helping them to get more hours of sleep. Once sleep is restored, their body will be better able to heal itself. If your patient is not feeling better after getting good sleep and making diet changes, the next step is to check their cortisol levels. You can do this with a fasting, morning cortisol blood test or a four-timed salivary or urinary cortisol (throughout the day). A 24-hour urine test is also an option but won’t show you the variation of cortisol levels throughout the day. I also recommend checking urinary catecholamine levels for a more complete adrenal health assessment. You may want to create a handout or follow up email to send to patients to help them learn how to read labels and encourage them to choose a variety of fruits and vegetables. DeMartino T, El Ghoul R, Wang L, Bena J, Hazen SL, Tracy R, Patel SR, Auckley D, Mehra R. Oxidative Stress and Inflammation Differentially Elevated in Objective Versus Habitual Subjective Reduced Sleep Duration in Obstructive Sleep Apnea. Sleep. 2016 Apr 12. pii: sp-00643-15. Cedernaes J, Osorio RS, Varga AW, Kam K, Schiöth HB, Benedict C. Candidate mechanisms underlying the association between sleep-wake disruptions and Alzheimer’s disease. Sleep Med Rev. 2016 Feb 11. pii: S1087-0792(16)00018-6. Fetterman JL, Holbrook M, Westbrook DG, Brown JA, Feeley KP, Bretón-Romero R, Linder EA, Berk BD, Weisbrod RM, Widlansky ME, Gokce N, Ballinger SW, Hamburg NM. Mitochondrial DNA damage and vascular function in patients with diabetes mellitus and atherosclerotic cardiovascular disease. Cardiovasc Diabetol. 2016 Mar 31;15(1):53. Thanks Dr. Donielle Wilson for sharing your knowledge! I really enjoyed reading this article and It was very helpful to me. Katherine, you’re welcome! I’m so glad it was helpful for you.